Spinach and Artichoke Dip is something I have enjoyed for a couple of decades now. I think Spinach and Artichokes just make such a great pair, especially when combined with creamy cheese. 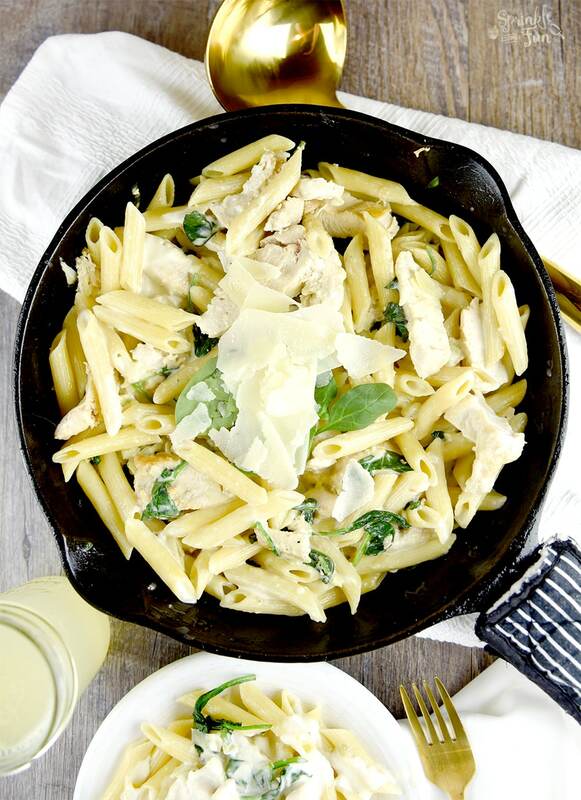 That’s where I got this idea for Spinach & Artichoke Alfredo Pasta. 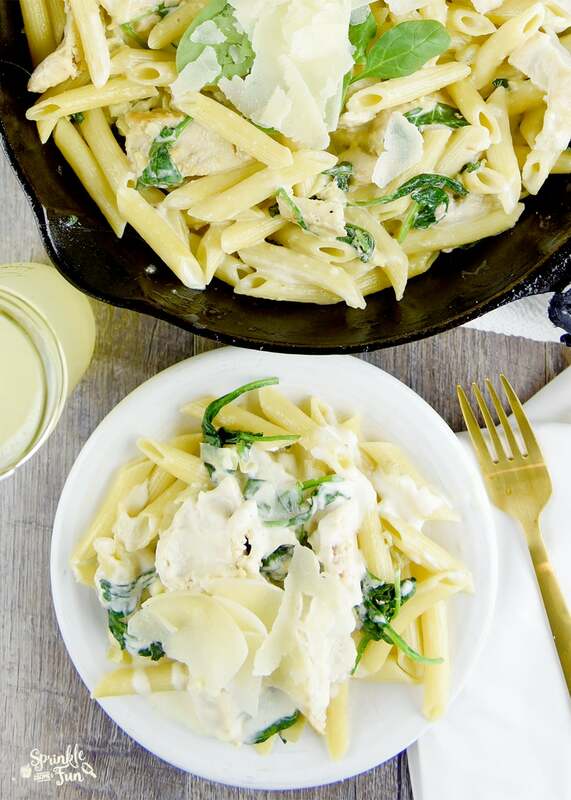 The spinach and artichokes give it a nice fresh taste and the creamy alfredo really rounds out the flavors. 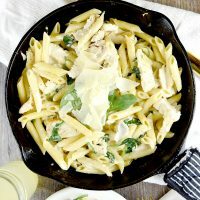 I like to serve it on top of penne pasta because I like how easy it is to add to the skillet once the meat and veggies are done. 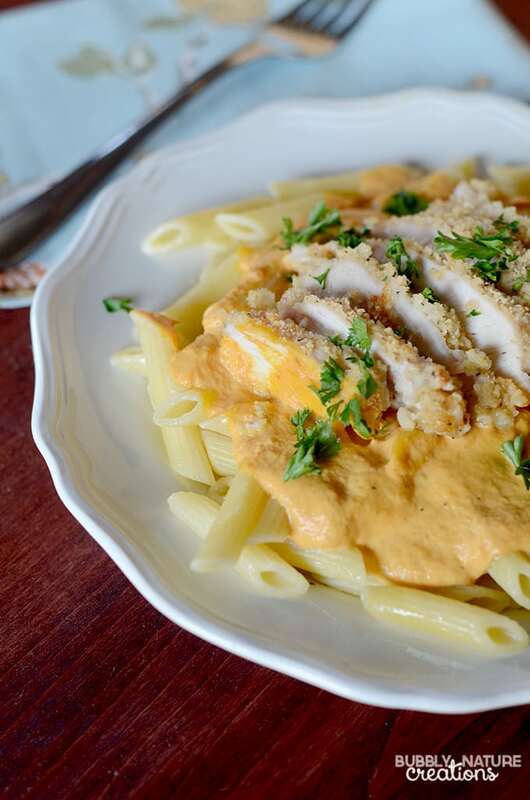 Plus, the alfredo sauce gets inside the penne pasta so you get a little more with every bite! 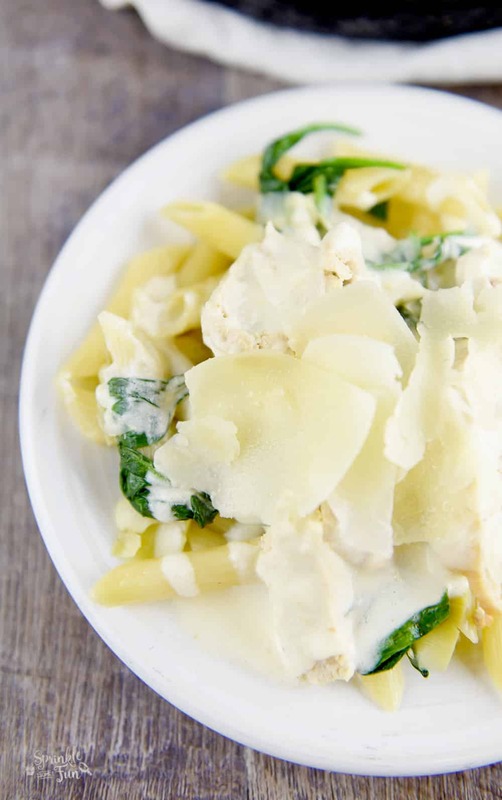 This Spinach & Artichoke Alfredo Pasta is sure to become a weeknight favorite dinner dish! I also like to add even more parmesan on top because I just can’t have too much parmesan! You can sub frozen spinach in this, but make sure to thaw and drain before cooking. First heat a saucepan on low heat and add all sauce ingredients. Cook for around 15 minutes and set aside. Meanwhile heat a large skillet on medium heat and add about 1 Tbsp. of water and spinach. Cover and cook until the spinach loses around half of it's volume if it is fresh or until heated if frozen kind. Then add the chicken, noodles, artichokes and sauce to the skillet and serve. 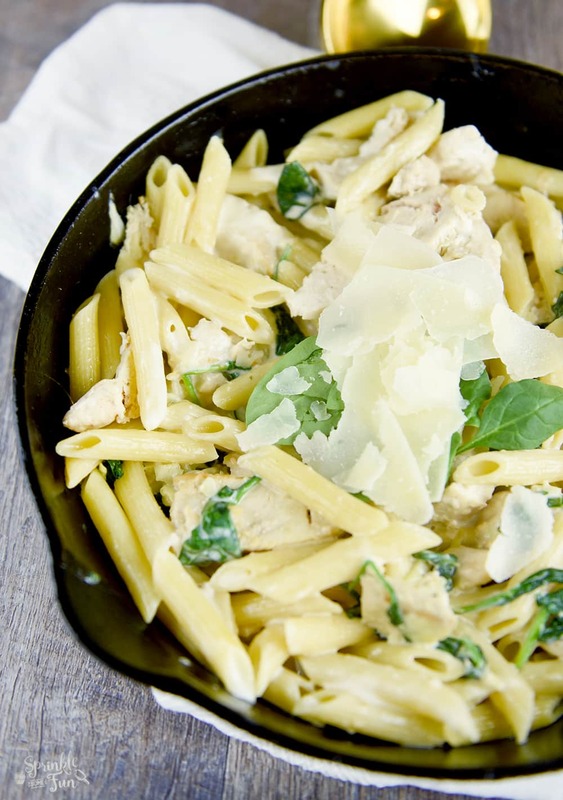 Serve with a sprinkling of fresh parmesan! Mmm. 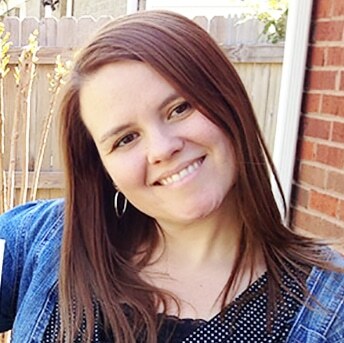 It’s so delicious and easy to make! It would rival most Italian restaurants in freshness and flavor for sure. What’s not to love? 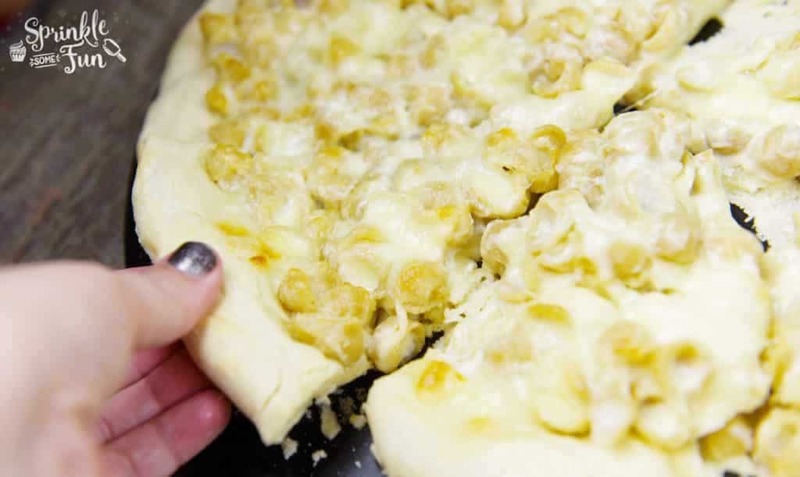 If you enjoy this recipe please share!